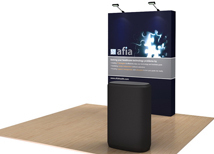 OneFabric pop up trade show displays are the most portable displays available. They have a seamless fabric graphic that attaches to the frame with Velcro and stays attached at all times. The display assembles in less than one minute and can break down just as quickly. This display is produced and printed in China, making the retail cost VERY low. Even though the graphic is printed in China, there is still a 5 day turnaround time! 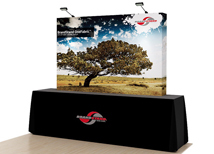 OneFabric pop up displays are the ultimate in portability and affordability. They assembly in less than one minute and are very easy to transport. These trade show booths are made in China but still meet NWCI's quality standards. The low price point makes these displays affordable for almost any exhibitor. 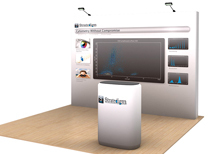 With the one fabric display its now much easier to look professional at a trade show without going over budget. 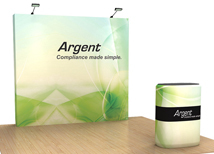 The OneFabric display is truly one of the best values in the trade show industry. 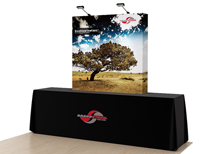 We also carry a full line of standard pop up displays that are very easy to transport and have a few more accessory options than the Onefabric display. 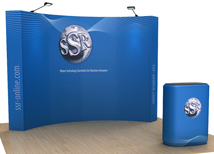 Banner stands are also a very affordable graphic display option that will keep you in budget. Banner stands are also small enough to carry onto a plane!